The Goods of the Woods Leaf Rectangular Rug, Model No. 11025, features an intricate leaf pattern that surrounds a center of cracked stone work. This gorgeous hearth rug is perfect for the Fall season, and is sure to add a touch of charm anywhere it goes. 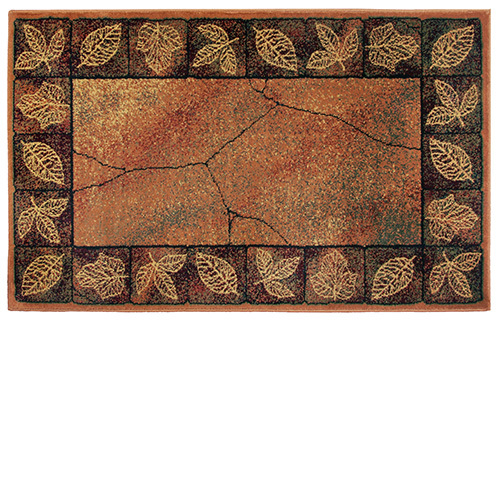 The Leaf Rectangular Rug is stain resistant so it will look great and stay clean with little maintenance. Made from superior quality colorfast yarn for added durability, the Leaf Rectangular Rug has been designed for a long lasting quality that you are sure to love. Will I need an carpet pad to protect my wood floor from being scratched by the underside of the rug? The underside is similar to an area rug without a rubber backing. A pad would be useful to keep the rug from sliding. Does this come in any other size? This rug is not available in a different size. What is this Goods of the Woods rug made of? Will it melt when embers fall on it? This rug is made of 100% olefin. In the event of direct contact with flame, it will smolder and will not discolor beyond 3 inches from the contact point with the flame. What is the back of the Good of the Woods Leaf Rectangular Rug 11025 rug made of? Does it have rubber backing? This manufacturer uses a tight 100% Olefin weave backing material. Rubber is not used for this model. What colors are in this rug and how thick is it? This rug contains various shades of browns, greens, and a bit of red. The rug is approximately 5/8 inches in thickness. How can this rug be cleaned? What type of fiber is it made out of? This rug is manufactured with olefin, which is a naturally flame resistant fiber. Lukewarm water and detergent can be used for cleaning, Olefin dries quickly, so we recommend line drying or low-tumble drying with little or no heat. Does this rug meet flammability standards? What material is this rug made out of? This rug does meet current FF1-70 flammability standards for hearth rugs. The item is manufactured from Olefin, which is a naturally flame resistant fiber. It is attractive and fits well in the spot in front of the wood burner in our 1820's brick house. We haven't had it long enough to give it a hot ember test, but it's nice to kneel on compared to the brick. Love the quality and beautiful colors in this rug. We are very pleased and will order again!! Good quality for a reasonable price. Searched for quite a while before I found a hearth rug that fit. I Really like this rug; it's pretty and just what I needed. This rug is very beautiful and plush. Looks great in front of our fireplace. After searching for a new hearth rug all over my area and not able to find anything, I began my search online to the usual "big box" websites. Again nothing suitable. Expanding my search I happened on to eFireplaceStore website. Wow, incredible selection! Something for every decor and taste. I found many that were very attractive but not the right size. Need one that is no more than 15" wide. Fell in love with Goods Of The Woods Leaf rectangle but it is 30". Colors are lush & warm. I decided to order it and give it a try, figuring I could cut it in half since the cut edge would snug up to the stones under the fireplace. If it worked I would have 2 rugs. Price was right & ordering was VERY easy. I didn't bother with expedited shipping, as I do often. It wasn't necessary because it was shipped immediately and received in just a few days. The rug is even more attractive in person. Nice and thick. Really enhances our "lodge" look. I am extremely impressed with EFireplaceStore and LOVE my 2 for one purchase. The rug is everything we expected and more. The rug is everything we expected and more. The service was great we received it 3 days from ordering it. We will do business with them in the future. 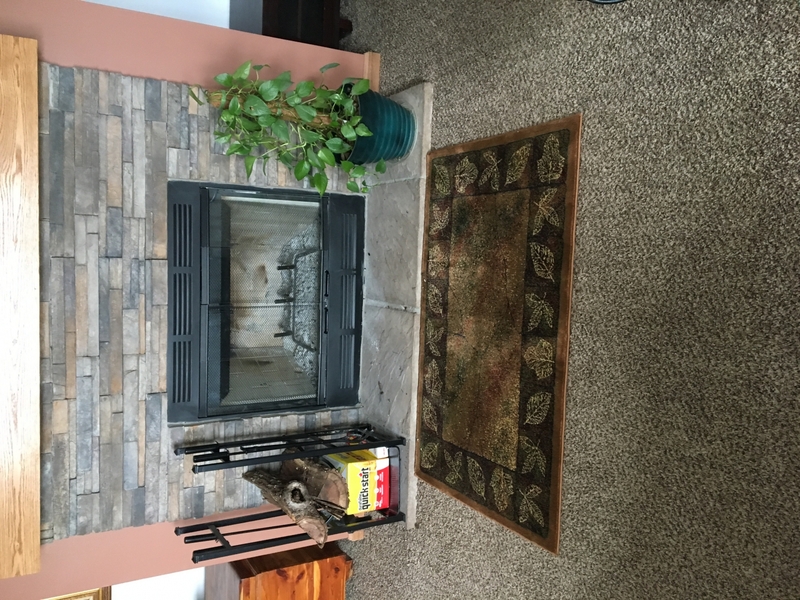 I had set a limit of $100 for a fireplace rug, but when I saw this one, read the reviews, and checked out the materials it is made from, I decided to take a chance and spend a bit more money and am so glad I did! The rug is exactly as described and the quality is OUTSTANDING! The colors are beautiful and blend in perfectly with my decor. I am very pleased with this purchase and so is my husband! This rug is beautiful. It has a plush feel and the colors blend well with many other elements in the room. I was so pleased with it. We have a double sided fireplace and 'm considering one for the other side as well. I have had disappointing experiences with other rugs I've purchased online, but I'm so happy with the efireplace site. Definitely recommend. Received this rug and is definitely a high quality product. Size is a little smaller than advertised but not a problem for me as we ordered two. ProsVery sturdy and high quality workmanship. My wife and I just replaced the wall to wall carpeting in our family room where our fireplace is. The old carpeting had many, many burn marks from sparks that spit out from the fireplace even though there is a 20" hearth stones on the floor in front of the opening. To protect the new carpeting we purchased this 30" x 50" Goods of the Woods Leaf Rectangular Rug. It arrived within a few days and it has exceeded our expectations. The colors and design are a perfect compliment to the color of our carpeting and our stone fireplace! In addition, the feel of the rug is much softer than we had expected. We love it! We keep the fireplace screen closed except when adding wood so we have not seen any hot sparks land on the Goods of the Woods rug but I trust it will not singe as did the carpeting. ProsAttractive, soft, and spark resistant. Colors are not as vibrant as I would like where I put the rug. Looks more brown/black. In very bright light like sunlight colors are true to picture. The rug is well represented in color and design...looks great in spot it was purchased for!! It was delivered fast and well packaged!!! It was a gift for mom and she is thrilled with it!!! ProsGreat quality at an affordable price!!! Received the rug 2 days after ordering. Excellent quality. Nice quality, beautiful colors/design. Prompt delivery. Was very pleased with this rug. The color was pretty much the same as it shows on line. It looks great in front of my fireplace. This rug is beautiful. ! A great size and brilliant colors. I am very pleased with this purchase. Rug is lovely, was well priced, & arrived quickly. Thanks :) ! Rug came as expected. Excellent deliver. Nice colors in the reds, oranges, golds. Has performed well handling sparks that fly out from the fire place. Overall a nice option for a hearth rug that looks a little more modern and stylish compared to what else you see out there. I love the design and size of the hearth rugs I purchased. One was absolutely perfect for my fireplace and even buying two the price was outstanding. I will use the other as a backup, it is not quite as big but my daughter loves it. They arrived quickly and in great shape. Got this to replace the hearth extension for my wood insert. This is soft, beautiful and does the job it's supposed to do. Have had a few embers fly out and land on it and have not seen any burn marks yet. Warm Browns and reds, just as nice as the Internet picture. Plush and comfortable, very well made. A little pricey but how often do you buy a flame retardant rug, much less one this nice? I would do it again. Like the rug, the colors are great. It is a thick rug too. I do wish it had a non skid bottom. I had to purchase a non skid for it. The rug is great, service was great! Very pleased with the quality, appearance and price of my new rug. Will highly recommend this web site to others. On a scale of 1-10, I would have to give at least a 20. Outstanding! Nice rug , I like it and it does what it is suppose to do. The rug is soft, thick, and beautiful. We have not lit a fire yet, but we love the design. Much more than I expected. Beautiful design. Quality of workmanship was amazing for the price. Loved the hand stitched border. ProsThe rug added so much beauty to the front of my fire place.